I rarely set a formal table.. and by rarely I mean pretty much never. The one exception is Thanksgiving. I do drag out all the fine china an set a pretty tablescape for that one meal of the year. Needless to say, I don't have a lot of table decor in my stash, so I have to be creative and think outside the box. And using what I have on hand often leads to beautiful results. I think this project is a great example of that. First I cut the bag down, but don't throw out the leftover piece! We'll use that to create the leaves! Next I printed out the names in fancy script (my handwriting is atrocious!) I put the print out on top of the bag and traced over it using quite a bit of pressure in order to leave an indentation in the bag. 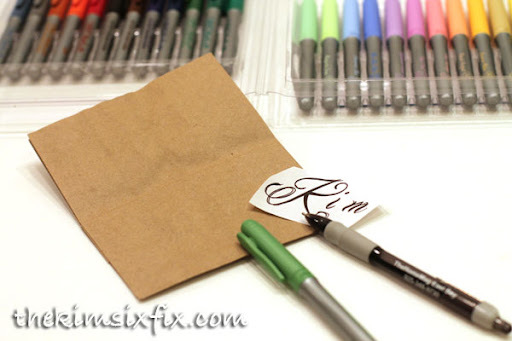 Next I used two BIC Mark-It™markers to color the leaves and add some shimmer. I choseYellow Gold and and Emerald Green to match the name on the bag itself. 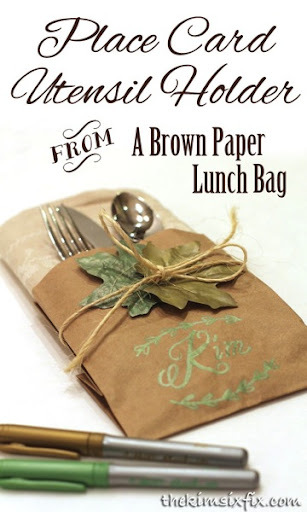 After adding the napkin and utensils to the bag, I tied the leaves onto the front making sure to let the name show. I think it is pretty cute, and not much work. It is easy to make the holiday Merry and Bright using the vast array of colors and finishes available. I could whip up on for every guest in next to no time! Plus right now BIC is offering a $1 off coupon so you can get your holiday crafting on for less money. And If these place cards aren't your cup of tea, BIC also has an entire booklet full of inspriational ways to add some brightness to your Holiday. You can get the booklet of merry marking and a coupon to start marking your own holiday merry and bright! I'm challenging three of my favorite tablescape bloggers (and you) to try their hands at #BICMerryMarking: Kathe, Susan, Yvonne, Jennifer!